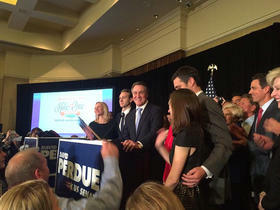 Now-Senator David Perdue, R-Georgia, in a file photo of his victory celebration at the Intercontinental Hotel in Atlanta on Nov. 4, 2014. Georgia’s new U.S. Senator, Republican David Perdue, has been in office less than a month. But he has already proposed some bills, and lined up with his party for upcoming battles with President Obama. WABE’s Denis O’Hayer spoke with Perdue about the President’s recent State of the Union message, and whether Republicans will negotiate with him on issues from health care to the Keystone pipeline.